I am writing to you from Germany. Currently, I am sitting at my tiny desk in my old room at my parents’ house. The window is wide open, the birds are chirping. It smells like spring. Surprisingly, the sun is out right now (it’s a hit or miss these days). I am having a quiet moment to myself. That’s rare these days, and so I am savouring this me-time even more. I haven’t fed this blog in a while, I know. But there has been a lot going on in my mind as I am juggling some creative work and my tiny human who is growing up way too fast. Doesn’t every mama say that? I am one of them now. My new role as a mother has consumed me. I am not going to lie: It has been pretty exhausting the past 5 months. BUT I also wouldn’t want to change it for the world, anymore. I have grown as a person; there’s a new identity in additon to being a writer, wife, friend, daughter, sister - and probably so much more that makes me who I am. What’s new? A little more than 3 weeks ago, Karl and I braved our first transatlantic flight together. Boy, I thought I wouldn’t be nervous, which is unlike me, but I felt pretty good until…well, until about three days before. 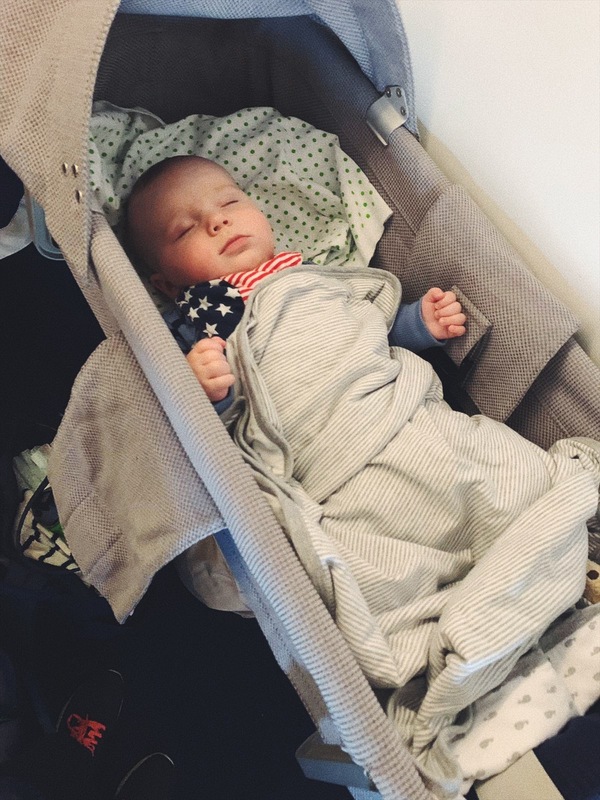 It eventually hit me that I will be taking my, at that time, four and a half months old very vocal baby boy on an 11 and a half hour flight to Germany. Wooom! Here come the nerves. I spent the weekend meticulously planning the packing of the diaper bag. I threw in 20 diapers in addition to carefully arranging burp cloths, a few more clothes (because you just never know) for both Karl and I, wipes, a couple soft toys, a few snacks for myself (because littles just needs the milk bar which I am carrying with me anytime anyway), essential travel documents, baby anti-bacterial wipes and hand sanitizer. Germophobia is real, you guys. All the while, Karl wasn’t phased by anything because, well, he’s a baby and was not aware of the big trip coming up. Funny how I enjoy flying so much, but got a whole new perspective on the process now that I have a tiny human to take care of. We left on a Monday afternoon. Rickey dropped us off at the airport, we checked in, and then said our goodbyes. Now, it was Karl and I and two carry-on (diaper) bags. TSA was a breeze. Luckily, there were maybe two people in front of us and Karl could stay in the carrier. With TSA pre-check, the whole process took maybe two minutes. And off to the gate we were. Phew, first hurdle. The timing worked out well, as we had about 20 more minutes until boarding. 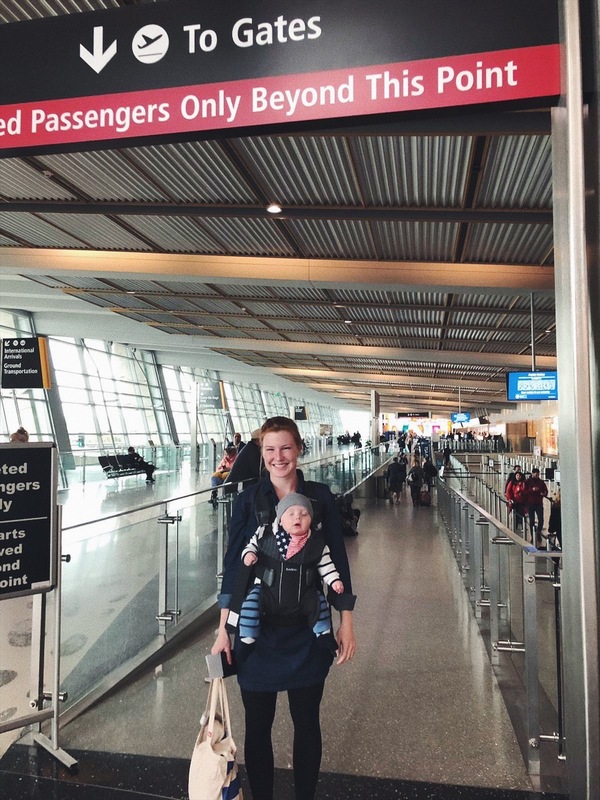 Not too long but enough time to catch my breath and keep reassuring myself that everything would be just fine and I wasn’t the first person flying with a baby. I was on the other end of the spectrum now. That person boarding the plane. I saw the worried looks; I also saw other people with kids and the friendly faces. My anxiety, however, spiked when Karl, all of a sudden, had a meltdown. Of course this had to happen. I was just waiting for it as a nap was way overdue and he probably was hungry, too. And there I was. Breaking a sweat, trying to calm down my little one as I was frantically looking for a quieter place to breastfeed him. This, then, helped for a couple minutes. But this baby was still tired and couldn’t just fall asleep with so much stimulation around him. Finally, we could board. Karl was dozing off in the carrier. I had hope again. On the plane, everything went smoothly. We had a great aisles seat and lots of leg room in front of a wall where, once up in the air, a bassinet should be attached. Game changer and so worth it in my opinion. The crew was very nice and understanding and so we settled in nicely, Karl being awake for take-off but distracted by all the noises and the new surrounding. He was just chilling on my lap and I tried to breastfeed him to equalize his ears during the ascent. He didn’t even seem to bother. I eventually started to relax. 11.15 hrs flight time ahead of us. Okay. We can do this! I got him down at his usual bed time and he slept 9 hours in total in the bassinet. Since there was no one sitting immediately next or behind me, I had some space to kick back, as well. Win. Another mommy with a 6-month old was sitting in my row, which was nice. It was smooth sailing. Karl was well-rested after a good night’s sleep better than at home. I believe the humming of the plane was contributing to it. The descent was not as easy as the take-off; chubbels had some ear problems. Hence, he cried a little albeit nursing. Yet, he was being a trooper and we eventually waved goodbye to the flight attendants who assured me that he was being such a good baby passanger. And, secretly, I was pretty proud of him - us - for managing so well on our first long-haul flight. I crashed when, finally, my parents and my cousin welcomed us in Frankfurt. Both Karl and I snoozed through the car drive up north. Yes, I am not going to lie: Flying with a baby is definitely a different ball game but now that we’ve done it once, I am confident that the flight back to San Diego will be doable, as well. And the good thing? I don’t know what’s going to happen and frankly, I wouldn’t want to. We’ll just go with the flow this time around, embarking another little mini-adventure. Until then, we’ll hang out over here, in Karl’s “other home”. For our real-life German-American family tale, follow @bell_ventures on Instagram. Also, tag along on The Redhead Story’s Instagram, Pinterest, and Twitter if it strikes you fancy.